Why is a natural shoreline important? What is a shoreland buffer? How can I establish a shoreland buffer? What do I need to consider before I plant my shoreline? Why choose native plants for the shoreline? How should I prepare the site? Where do I find a list of plants appropriate to grow in my area? What kind of maintenance is necessary for native planting? Who can I contact if I have questions or a problem related to shoreland revegetation? What are some additional resources about shoreland revegetation? Undeveloped or restored shorelines carpeted by woods, meadows, or marshes enhance the quality of Minnesotas lakes and rivers, as well as our recreational opportunities. If youre lucky enough to have shoreline that hasnt been developed, think before you clear it. If your property has already been altered, there are steps you can take to have a more natural shoreline. Natural shorelines help protect water quality by slowing runoff, reducing erosion, and filtering nutrients that can cause algal blooms. They also provide habitat for wildlife and can deter nuisance species like Canada geese. Natural shorelines add beauty and color to property, increase privacy, and can reduce the amount of time you spend on lawn care! By improving water quality, habitat, and appearance, a natural shoreline can even improve your property value. 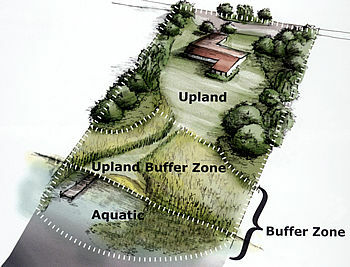 A shoreland buffer strip (also called a filter strip or buffer zone) separates your lawn from the lake. It typically includes taller grasses, blooming plants, shrubs and trees, as well as aquatic plants such as cattails, rushes, and lilies. The easiest approach to establishing a buffer strip is simply to do nothing. If you stop mowing, weeding, and raking your shoreland area, many native plants will likely reestablish. Plants such as spike rush, sedges, and arrowhead have become established on some shorelines when people stopped cutting and raking. Another option is to actively restore the site by replanting native vegetation in the water and on the adjacent land. 1. Start by assessing your site and the different ways you use it (e.g., swimming, making campfires, docking your boat). Carefully plan your project and prepare the site. Select and plant appropriate native plants. Maintain the area so the plants become well established. Consider the specific conditions at your site, including light, moisture, orientation, and degree of slope. Identify soil type and the type of lake bottom (mucky, sandy, rocky). Think about where youre located on the lake  do you get a lot of wind and wave action, or direct sunlight for much of the day? Consider how you want to use the property and how much of your shoreline you want to restore. Resource professionals recommend that you maintain a shoreland buffer along 75% of the shoreline frontage. Keep in mind that the goal of shoreland restoration isnt to eliminate access and recreational use, but to provide the benefits of a natural shore, while allowing those uses in carefully defined areas. Shoreline revegetation is most likely to succeed in areas that are sheltered and experience little or moderate wave action, do not experience significant changes in water level during the growing season, and are not very steep. Native plants are plants that grew in your area before European settlement and the introduction of cultivars and exotic species. The extensive root systems of native plants help protect your shore against erosion. Removing the native plants and replacing them with shallow-rooted turf grass causes many shoreline erosion problems. Native plants improve habitat for fish and wildlife. Minnesota animals are adapted to native vegetation and rely on it for food, shelter, and nesting. Imported cultivars or exotic plants dont provide the same wildlife benefits. You reduce the chance that exotic plants will invade when native species are in the shoreland area. A healthy population of native plants is better able to withstand competition from exotic species. Native plants can reduce the need for lawn chemicals and fertilizer that may end up in your lake. Finally native plants are better adapted to Minnesotas climate and growing season. By choosing natives, youll preserve a more natural appearance and probably have better plant survival than with imported cultivars. Steps required to prepare the site for planting include removing exotic vegetation within the planned buffer area, thinning existing vegetation to allow new plants to become established, moving any docks or paths located in the revegetation zone, and grading slopes if necessary while taking care to prevent erosion. Once the planting takes place, mulching around the new plants helps reduce invasion of undesirable species. Finding native plants appropriate for your area of Minnesota may be difficult. Prairie plants that would fit well on the shores of southern lakes arent necessarily appropriate for northern Minnesota. You can try local nurseries, your SWCD or Extension office, the regional DNR office (Ecological Services), or the county biological survey. A county Master Gardener may be your best bet to find out where to get plants that are truly native to your area. Nurseries may carry plants that are labeled "native," but that might mean native to North America, the Upper Midwest, or anyplace in Minnesota. A good idea of what aquatic and upland plants will do well in your area can be obtained by boating around your own lake. See what grows naturally in the water and what plants are working for other property owners. To accelerate the naturalizing process or to feature particular plants, your best option is to plant seedlings. Select appropriate plants for each of the shoreland zones (upland, near shore and in the water). Do not harvest wild seeds or plants or purchase from nurseries that wild-harvest. Wild stocks should be left to self-propagate. Do not buy generic wildflower packs, because they often contain unwanted weed seeds. Before installing aquatic plants, obtain a no-fee permit from the DNR. A shoreland restored with native vegetation should maintain itself. Apply mulch to new planting beds to prevent soil erosion, hold moisture in the soil, and control weeds. You may need to water and weed the first season, but once the plants are established, they will be able to out-compete most weeds. Native species should never be fertilized because they are adapted to the nutrient levels found in local soils. Fertilizers and pesticides applied to areas near shore can be a threat to aquatic life and water quality. Plants left standing in fall and winter provide seeds and shelter for wildlife, add interest to the winter landscape, and protect the soil from wind erosion. If some plants do not survive the first year, replant as quickly as possible to maintain a continuous vegetative cover. As your shoreland buffer grows, you may want to trim some tree branches or shrubs to keep your view of the lake clear. "Shoreland editing" gives you a view while maintaining the benefits of a natural shoreline.